There are few individuals who have more positively influenced the landscape of young readers and libraries than Ellen Fader. She began her library career as a consultant at the Kansas State Library in 1973 and moved on to positions in Ohio, Virginia, Connecticut and, since 1995, until her retirement, with Multnomah County Library in Oregon. Her list of personal accomplishments is a long one. She is a practitioner, author, teacher, reviewer of books, a trainer, consultant, and a leader. She serves as a mentor to numerous young librarians. But even more important, her vision, unfailing energy, generosity and leadership and have contributed to the flourishing of children’s library services throughout her community, the State of Oregon and the nation. Ellen is loved and respected by her many colleagues and mentees. Ginnie Cooper, formerly Director of the Multnomah County Library said, “Ellen is the best youth services librarian I know!” Dr. Virginia Walter, Ph.D. (formerly) Professor. Department of Information Studies Graduate School of Education and Information Studies, UCLA and past president of ALSC, said “Ellen Fader is the epitome of a reflective practitioner. Throughout her career, but particularly as a manager of children’s services, she has consistently approached her work with commitment and intelligence.” It is her passion and vision, leadership and great generosity which make Ellen Fader our national treasure. As one of the most influential and forward thinking Youth Services Directors in the world of public libraries, Ellen has made a lasting impact on a national level. She served as both member and chair of the John Newbery Award committee and also served on the 2012 Randolph Caldecott Award committee. She served on the ALSC Board and is a past president of the division. After her retirement, she continues her impact on the field in her support of developing a cadre of new and diverse librarians to work in the field of library service to children. For a fourth year, Ellen will provide a generous donation to the Spectrum Scholarship. These funds will support a Spectrum Scholar through the 2017-2018 school term, provide for a follow-up grant for a Spectrum Scholar alumnus entering their final semester of work in Fall of 2017, plus discretionary funds to use towards job interviews. Ellen Fader is the librarian that we all want to grow up to become. 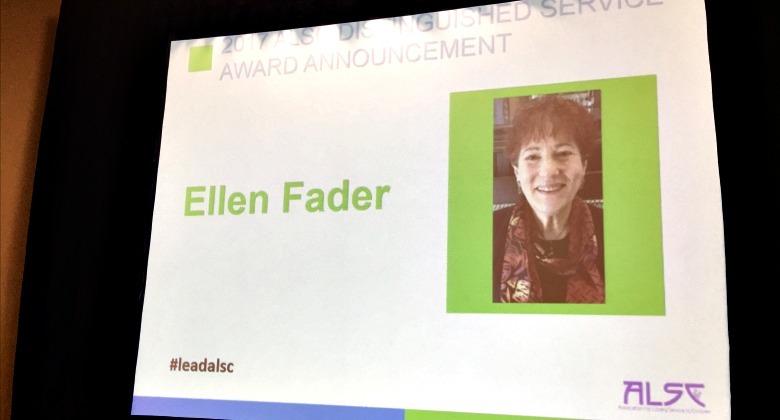 ALSC is pleased to honor Ellen Fader with the 2017 Distinguished Service Award. The 2017 ALSC Distinguished Service Award Committee includes: Chair, Jeanne C. Lamb, New York Public Library (retired); Patricia A. Clingman, MidPointe Library System; Katie O’Dell, Multnomah County Library; Ms. Angela J. Reynolds; Annapolis Valley Regional Library; Dr. Timothy R. Wadham , Puyallup, Washington. Your contribution to Children’s Services is an inspiration to me.